Of course, our argument here isn’t just that “all the cool kids are doing it.” On the contrary—we think this platform’s time has come because there are a number of benefits that it can provide to savvy recruiters that simply don’t exist on places like Facebook or LinkedIn. Ultimately, it’s the emergence of these benefits, more than any other marketing trends, that’s brought us to the point where Snapchat is an increasingly indispensable element in a recruitment marketer’s toolkit. What are those benefits, you ask? Read on to find out! Okay, this benefit might be the most obvious on the surface. But if we dig a little bit deeper we find that Snapchat isn’t just a haven for younger users, it’s also a place where it’s possible to reach candidates who might not be interested in traditional recruitment marketing. These are people whose eyes might glaze over when they see a YouTube recruitment ad playing before their selected video, but might be willing to engage with something that feels more offhanded or improvisatory—i.e. more authentic. The trick here is to always be providing value for your users. In the case of Snapchat, this value can come in the form of the whimsical, creative, and delightful content that no other platform is really able to provide. A Facebook ad with a clear distillation in somber terms of your EVP might not really add much value for some of your ideal candidates, but, bizarrely enough, a snap of your hiring managers with mustaches drawn onto their faces might. Some of the traditionalists reading this might blanche at the suggestion that some people need to be reached with a less formal, less polished version of your employer brand—but hear us out! 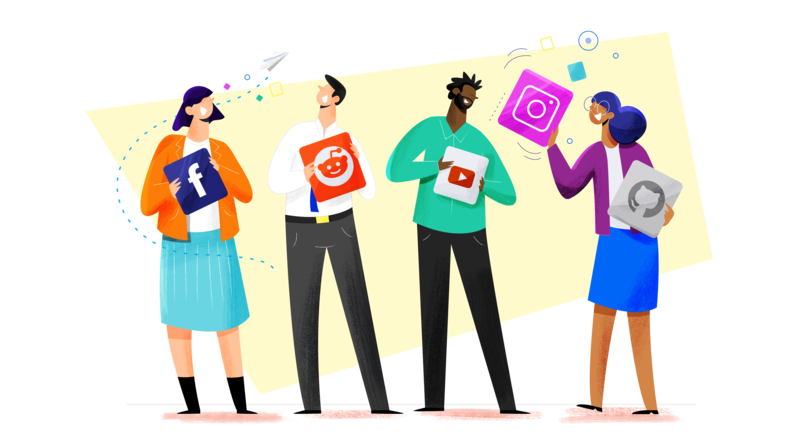 If your candidate personas are attracted to a strong sense of community and a lot of interaction with a vibrant team, then that’s exactly the aspect of your EVP you should be promoting to them (assuming you really do offer those things). And community isn’t something that can be created by committee—it’s not a process that happens from the top down, but rather an organic, informal result of people working and spending time together. Surely there’s some value to an employer brand that reflects that fact by seeming to arise from the bottom up. Of course, it’s impossible to run a social media campaign without a strategy, but if you can roll something out that doesn’t feel like a traditional marketing strategy (something that Snapchat really does give you the tools to do), you can reach a whole new group of candidates who might not have given you the time of day otherwise. I know what you’re thinking: if Snapchat is really that different from other platforms, it’s going to take a lot of work to craft and implement a winning strategy there. And to a certain extent, you’re right. You won’t really be able to reuse much of the content that you post on other platforms, and most of what you post on Snapchat won’t be appropriate for any other channels. But this doesn’t necessarily have to be a bad thing. As a recruitment marketer, Snapchat gives you a chance to flex your creative muscles in a new way, using a fresh set of tools to develop a new incarnation of your employer brand. In the process, you might find that you learn things about your employer brand, and even gain a new understanding of your brand story can be told, that applies not just to Snapchat but to your recruitment marketing efforts more broadly. If, for instance, you find that a large number of users on Snapchat respond positively to the chance to see “a day in the life” of one of your employees, that tells you something valuable that you can apply to other employer branding activities. By the same token, if you’re having success with less-than-professional quality photos that have a more informal feel and tone, you might experiment to see whether or not your success is Snapchat-specific. Maybe the rest of your social media followers would benefit from seeing another side of your employer brand. There’s only one way to find out! Snapchat is radically different from many of its predecessors in terms of format and content—but those aren’t the only differences. Most, if not all, social media platforms in recent years have made a push towards more mobile-friendly functionality, but Snapchat is leading the charge in terms of mobile experience. In fact, the platform really only exists in the form of a mobile app, which presents recruiters with a challenge and an opportunity. The challenge? Optimizing your recruitment flow for mobile phone users. HR departments at top companies have historically been pretty bad at this, which is a shame, because letting candidates apply easily on their phones is a great way to drive up applications. If you’re leveraging Snapchat ads as part of your larger recruitment marketing strategy, you’ll need to be able to direct users to mobile-friendly landing pages from which they can apply or take other actions (like signing up for an email list)—otherwise those impressions and clicks are all wasted! But, like we said, this challenge comes with an exciting opportunity. If you can create a mobile application flow that will be effective for converting Snapchat leads into applicants, not only will you be able to drive up applications from Snapchat, you’ll be able to provide mobile-friendly UX across your entire web presence. By reducing the barrier to entry for your applications in this way, you can garner more qualified applicants from every corner of your recruitment network.